A stiff and stoic Ossomer scrunched uncomfortably in the saddle of Ansom's carpet, hating it. He could recall ridiculing his brother for using this conveyance, rather than a Unipegataur. It was awkward, and it looked unseemly. More to the point, a magic item would not fight or take an arrow or a blast for you, the way a proper mount would. Ansom claimed the versatility and range of the thing made up for that, but Ossomer disagreed. And just at the moment, he would have given much to have been mounted atop a living unit. Because for that lack, he could now also blame the doltish thing for placing him up here. Here above the battle he floated uselessly, left out of Lord Hamster's purported genius plan. Out of the way of history. Hanging limply in space. What exactly did it mean, that he had come to this place? It was not the first time he tried to make sense of the question. The Titans had a plan, and that plan was expressed in the balance of power. 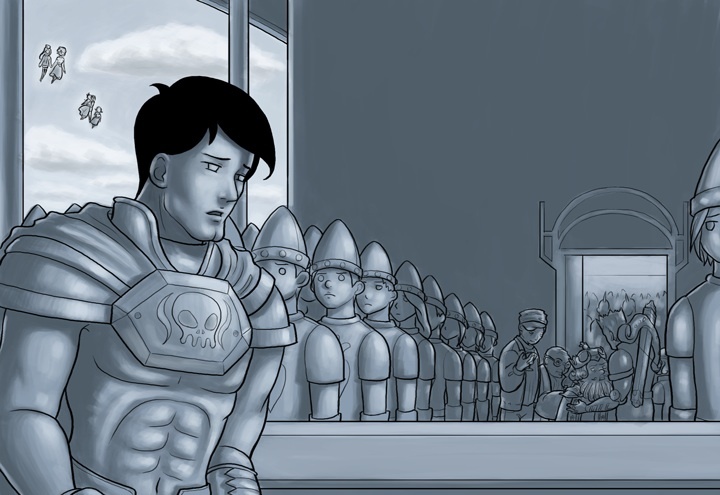 Royal sides had held their supremacy since the dawn of Erfworld, but now the Titans had something different in mind. Surely, that was well and good. It must be. In battle, he had fallen as a Royal and been re-popped in the service of the Titans' Tools. As a Royal, he had been an obstacle to the Titans' will. The Titans had un-gently shoved him aside. So was that it, then? Was that his entire Erfly significance? A barrier removed? Ossomer glanced down at the forces of Gobwin Knob, his side. The Lady Sylvia was stacking dwagons for...siege? It certainly seemed that way, with the purples bunched directly below his feet. Odd choice, using siege from the inside. But his eyes traced upwards along the length of Jenga Tower, and he realized just how effective that tactic might prove. Father was still deployed there, as far as he could tell. The casters certainly were, standing around behind the ranks of arrow-spent archers, who looked bored and apprehensive. At that very moment in the warlord's musings, King Slately did emerge from the tower interior. He stepped to the rear of the archer formations and began addressing his casters. Ossomer's mouth opened a bit. It suddenly occurred to him that he was about to witness his father's demise. The tower could take a good pounding, but it would fall to that many purples. Father would fall with it. And... Jetstone would fall with him. Such a thought to think upon, in the sunshine of the late morning. He peered over the city. Thousands of infantry, many of them troops he had led to victory against Haggar, were massing in the streets to counterattack the garrison. Beyond them, the pristine turrets and parapets of the outer walls stood impotent, irrelevant to the city's defense. Beyond that, orchards, green hills and the River Phoenix. This view was so terribly familiar to him. The stone floor of this tower top had borne his boots more times than he could number. Inches now separated him from that enemy ground. He could see a slightly crooked tile he remembered in the stonework. It had irritated him, he recalled. A misfit in the otherwise perfectly ordered masonry. Inches away, yes, but as unreachable as the stars. The tower top was impenetrable as a hex boundary until his side claimed the city. Enemy ground. Why was he lingering here? "...is a chance! ... at least ... considering, Pierce!" Ossomer raised his head. Lord Ace Hardware, the Dollamancer, was speaking animatedly to the group. Good man, that Ace. He looked away, so as not to draw their attention, and strained to overhear the conversation. "...have the flyers...(something)," said the Pierce, the Healomancer. "...could double the Unipegs if he flew (something)...!" said Ace. "Yeah, that's true," nodded Lloyd, the Dittomancer. "...true." "(something) leadership, come on," said Pierce. "...eager to fly against Ossomer? I think (something) nuts." Ossomer's eyes widened, then sharply narrowed. They were talking about entering the airspace, attacking him. Jetstone didn't have the flyers for that. With twenty-seven Archons under his Level 9 leadership, it was such a preposterous and remote possibility that he hadn't given it any tactical consideration at all. Nor, did he believe, had his Chief Warlord. Lord Parson had ordered the Archons to split into stacks of two and three, each with one unit with Leadership and at least one with Foolamancy, and to scatter around the airspace. That way, the casters and archers in the tower would have a longer and more expensive time shooting them down. And that's if it should even come to that. It wasn't meant to; the flyers' main defense was in being irrelevant to the ground battle. Ossomer believed all of these tactical assumptions to be perfectly sound, and hadn't given them a second thought. He glanced briefly over at the group, and for a terrible moment he locked eyes with his father. The King was staring upon him with an expression Ossomer had never seen on him. King Slately looked grim, which certainly he often did, but now in those eyes was the light of the hunter, a predator. His father was sizing him up as prey. He looked sharply away. It was ludicrous! Slately had never croaked anything outside of a summary execution. Ossomer could fell him with a...a kick to the knee. So why, then, did that look chill him so? The King closed with his Dollamancer, and spoke too low to overhear. Ossomer looked around, in a rising panic. He was not currently stacked with anyone. Should they launch a bum's rush at him with all of their forces, they very well could croak or capture him, and return to the tower. With Luck, they would survive without taking too much damage from the Archons. Titans. If he allowed that to happen, it would be the second time today. That thought should have been mortifying. But the moment it occurred to him, a soft calm infused his stomach and chest, and flowed like warm pipe smoke up his neck to fill his head. If he allowed that to happen. But if the Titans allowed that to happen, it surely would Signify something. He looked up at Father, prepared to stare him down this time. But the King had huddled with his casters and had his back turned. Still, that look was Signamancy. In a way that crowns and robes and scepters and thrones had never quite graced him with, his father now looked like a King. Being Royal did mean something, after all. It meant taking the mantle of responsibility for the power the Titans had granted you. Ossomer had stood up all his life, straight as a marble column, to bear the weight of that responsibility. He knew that stance when he saw it, and Father carried himself that way now. And he, slinking in the saddle after betraying a parley, no longer did. He'd had no answer for Tramennis' outrage, because he felt it too. He was shamed. Below, Lady Sylvia was stacking with the forward purples. He imagined she planned to tumble all units in a shower of rubble, without thought for the protocols of Royal capture and execution, for bestowing dignity and honor upon a fallen enemy king in their final moments. Let soldiers and Commanders and Kings all fall together into a pile. Had the Titans no use for such distinctions, in the Age of Hamster? No, surely they must. Surely the new mantle of Titanic power must be carried with even greater majesty. In some important way, the disciples of Lady Firebaugh and the Arkenpliers were failing their Duty, and would pay the price. He looked around the sky, at the distant scattered pairs and triads, and issued them no new orders. Leaving his sword in its scabbard, he pulled the carpet to the very edge of enemy ground. The Titans' will would be done, whatever might happen. He looked down, and the odd-shaped stone tile again caught his eye. But for once, it looked as if it were meant to be where it was. ^ Jenga is a party game where blocks are stacked in a tower, and each player takes turns removing one until the tower falls. This page was last edited on 3 February 2016, at 18:43.